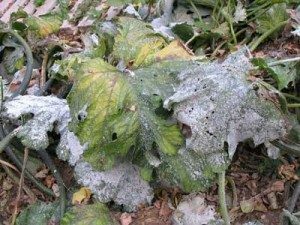 Powdery mildew is a fungal disease which flourishes on courgettes when the weather is warm and dry. Infected courgette plants are covered in a greyish-white mould, mainly on the upper surface of the leaves and young shoots. 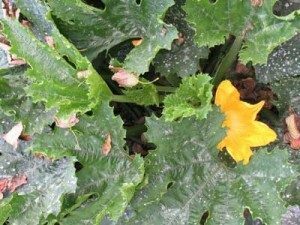 Mildew in courgettes shortens the growing season. The courgette variety Venus F1 hybrid has succumbed to powdery mildew and has died very quickly. The courgette variety Dundoo F1 is tolerant to powdery mildew and is still looking well, & producing courgettes, although it is planted next to a Venus which is covered in mildew spores. The Dundoo courgette plants have given huge yields of glossy, dark green courgettes. As well as being mildew tolerant it has the added advantage of a large open bush habit which makes picking easy. Although mildew has shortened the season in the Venus courgettes, the Dundoo season continues & will be prolonged by covering it with a cloche to protect from the frost. Attacks of powdery mildew occur in dry seasons and are worst in sheltered gardens. 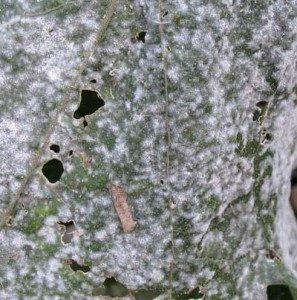 It is not known how the fungus survives between crop seasons, & crop rotation and many other cultural practices seem to have little effect on the incidence of powdery mildew. Courgettes need fertile soil. Plants grown in poor soil, without correct applications of fertiliser, will develop powdery mildew before well fed plants. Healthy, vigorous leaves and stems are less prone to infection. 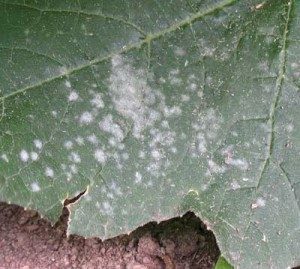 Chemical sprays are available to control powdery mildew in courgettes, always follow the instructions on the packet.